It was on this day of Nov 18th, 294 years ago, that the French merchant ship Les Deux Freres, The Two Brothers arrived to the Gulf Coast near Dauphine Island (Alabama). Upon this ship was the first large group of German settlers in contractual agreement with John Law's La Compagnie des Indes - later known as the West Indies Trading Co and as the Mississippi Co. There were many more ships to come and upon them many many more German settlers. It is important to note however that these settlers were mainly German in culture only and they continued to live under French rule in Louisiana until the Spanish reign began in 1762. There are accounts of the terrible conditions at port for those wishing to depart France for the new world and it is believed that almost half of those wishing to immigrate died at the French ports of L Orient La Rochelle or Brest before ever leaving Europe. German Historians estimate that approximately 10,000 Germans, encouraged by the pressing hardships of the Thirty-Year War attempted to embark by ship to the Gulf Coast. It is believed that approximately 6,000 departed by ship and only a mere 2,000 reached Mobile. Many perished while at sea and sadly many more of that 2,000 died of exposure and starvation on the beaches of Nouveau Bilixi due to the poor accommodations and lack of preparations by John Law's Company. 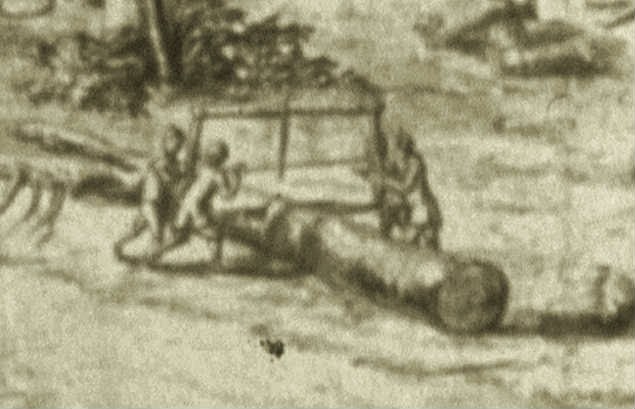 This image, painted in 1720, shows John Law's Concession of Nouveau Biloxi. The painting is incredibly rich with information of the settlers, the tools they used and the types of trades employed. Generously provided by the Newberry Library, Chicago. A large portion of these life-hardened souls traveled by foot to New Orleans, a new but growing port city. New Orleans was not the place for these Germans and they continued up river to the higher grounds of what the French called Les Cotes Des Allemands - The German Coast. 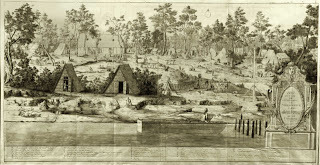 It is unlikely that the residents of La Nouvelle Orleans realized the importance of these passerbys as they continued up river to settle. It would not be long before these Germans would supply New Orleans with nearly all the produce and meats necessary for their rapidly expanding port of the Americas. 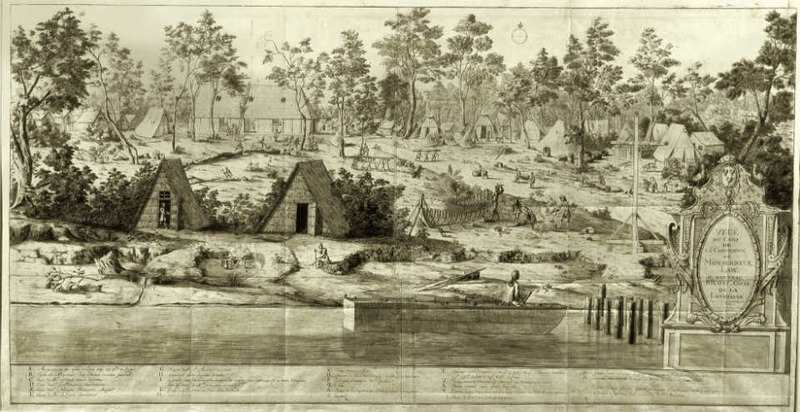 A French census of Louisiana in 1724 shows that the first settlement of the German Coast was approximately 30 miles north of New Orleans on the right bank of the Mississippi and about 2-1/2 miles away from the river in the direction of Lac Des Allemands. It was long Tradition that D'Arensbourg lead a group of Germans from the Arkansas River down and met up with the Germans coming by way of Mobile to found the first town on the German Coast. The same Census of '24 seems to contradict this, however, and refers to the original settlement only as Le premier ancien village allemand - The first German Village. D'Arensbourg, a Swiss man, was the leader of the Villages of Mariental and Ausburg also found in the Census and described as being near-by but closer to the river. These determined survivors of the old world played an immense role in the shaping of the new world of the Gulf Coast Region and left their own particular flavor on the muddy Creole banks of the Mississippi River. 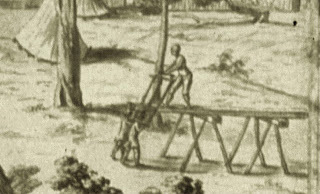 It is for this reason and the reason of my direct ancestral lineage from the Les Cote Des Allemands that I take such interests in them and their agriculture, foods, tools and the techniques they utilized when speaking of traditional trades and life in Early Louisiana. Commissioned in 1720 this pen and ink on cloth illustration by Jean Baptise Michel Bouteux holds an incredible amount of information on the early 18th century trades of Louisiana and even more remarkable is the clear depiction of tools being used by Coopers, Sawyers and Ship Builders among other things. My next blog entry will be a detailed look at this painting and the information therein so be on the look-out for that. A detail of workers bucking a log to length with an incredibly large Frame Saw. Journal de la société des américanistes, Les Allemands à la Louisiane au XVIIIe siècle - Vol 16. Images of Veuë du camp de la concession de Monseigneur Law, au Nouveaux Biloxy, coste de la Louisianne generously provided by Newberry Library, Chicago.